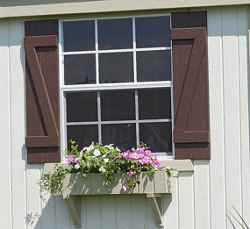 Add charm to your shed with the Little Cottage Company flower box. They are a nice accent to windows, add colorful flowers or grow fresh herbs. Add charm to your shed with the Little Cottage Company flower box. They are a nice accent to windows, add colorful flowers or grow fresh herbs. The design will match the style of your structure you have chosen and they are easy to install. ***Free shipping if ordered with your Little Cottage Co. shed. If you order the Flower Box without purchasing a shed additional shipping will be added. Please call 1-800-987-4337 for a shipping quote.